To get the selfish stuff out of the way: draft two of book two of Action Figures is almost done. Tomorrow is a dedicated writing day, and I don’t know if I’ll finish the climax, but I’ll come damn close. Aside from writing book two, I’ve spent a lot of the past month promoting book one. Mailers have been sent out, I’ve assaulted the Internet regularly, and I took out my first Facebook ad, which has been mildly successful in driving some traffic. I plan to revive the ad during Thanksgiving week to promote a 99 cent Cyber Monday sale, which will hopefully result in some sales. Another new initiative is a little more cooperative. My friends and fellow self-published authors Justin Aucoin and Rob Borkowski and I established the New England Self-Published Authors Group to promote our work, first and foremost, and eventually the work of others indie authors. We added one new writer, Jennifer Aqualaney, who is working on her debut novel, and we’re hoping she’s the first of many who will join the group. 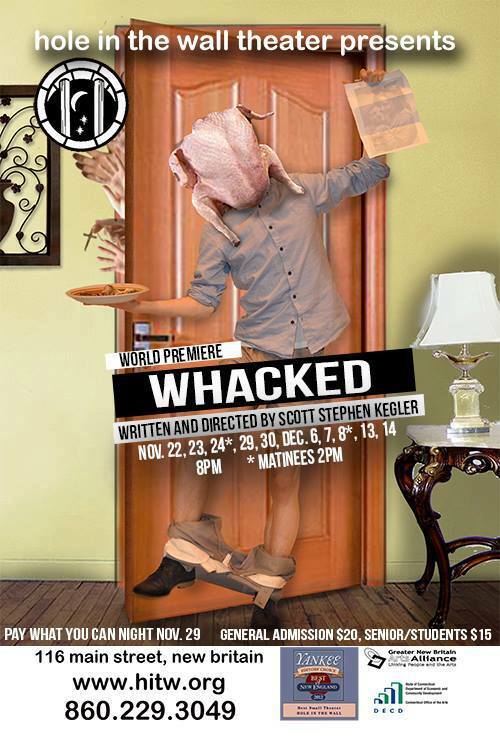 Ah, but my creative writer friends dabble in areas other than prose — to wit, my buddy Scott Kegler (of Commedia Mania fame), who is putting the finishing touches on his new play, WHACKED, which is about “turkey and masturbation.” I have tickets to opening night next Friday, and I expect to be both entertained and horrified. FYI, it’s not too late to get in on the madness, just got to the Hole in the Wall Theater web site and buy your tickets now. Yes, the show will be as disturbing as this poster suggests.